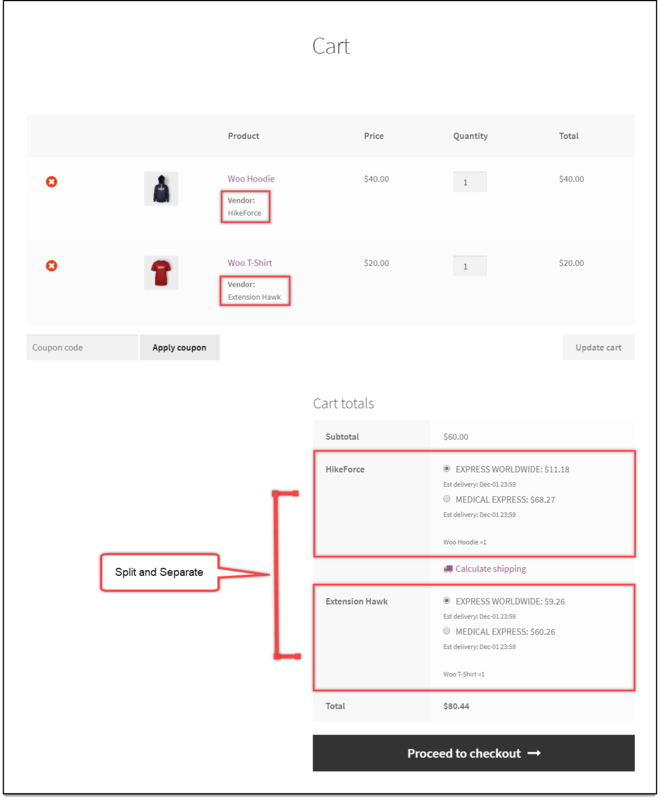 Home / How to set up WooCommerce Multi-Vendor Add-On with ELEX WooCommerce DHL Express Plugin with Print Label and Dokan? 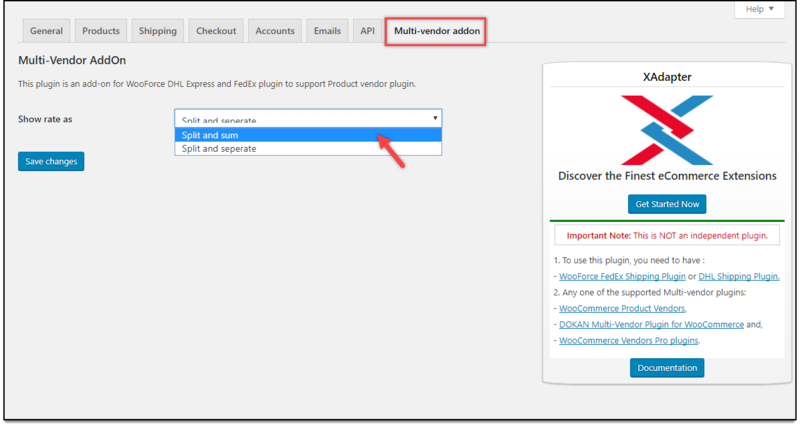 This article is intended to explain how you can configure Multi-vendor marketplace, using WooCommerce Multi-Vendor Add-On plugin, WooCommerce DHL Express Plugin with Print Label, and Dokan Multi-Vendor Marketplace plugin. The Multi-Vendor Add-on transforms your WooCommerce online store into a powerful, robust and feature-rich online shopping center. With this add-on, multiple independent vendors can sell their products via a centralized product catalog and facilitate you to ship through FedEx or DHL. From the customers’ perspective, they can buy products from multiple vendors in a single order. Multi-Vendor Add-On for Shipping Plugins. ELEX WooCommerce DHL Express / eCommerce / Paket Shipping Plugin with Print Label. Dashboard > WooCommerce > Settings > Multi-vendor addon. The plugin settings are as shown in the screenshot below. Split and sum: Sums up the amount of all the items from the vendors and shipping cost of each item. The total cost will be shown to the customer. Split and separate: Separates the items according to each vendor, and shows the total cost of shipping vendor-wise. Click Save changes after selecting the desired option. To setup multi-vendor marketplace, you first need to add WordPress users and assign Vendor user role to them. Creating a new WordPress user is pretty straightforward. Go to Dashboard > Users > Add New. 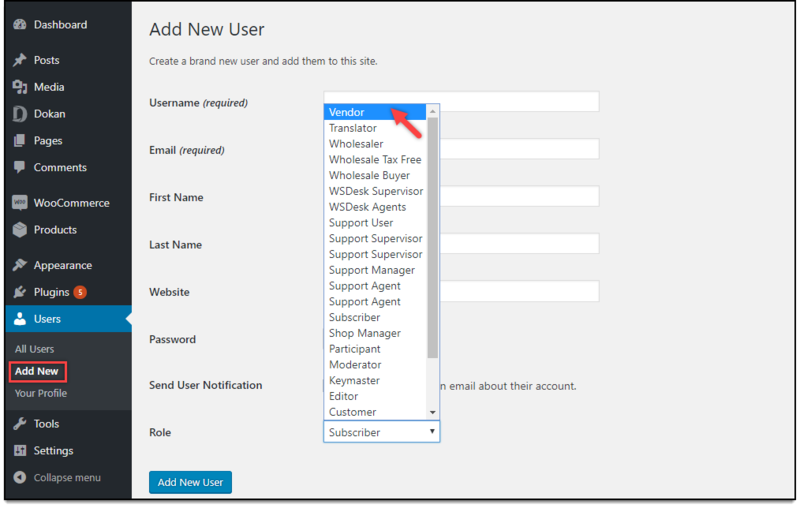 Once you have installed the Dokan Multi-Vendor plugin, a new user role called “Vendor” will be available in the WordPress user role setting. Select this role and enter user details like name, email ID, shipping and billing addresses among other details, and save the settings. You can create several vendor accounts in the same way. The created vendors can log in, and add products to your WooCommerce store. 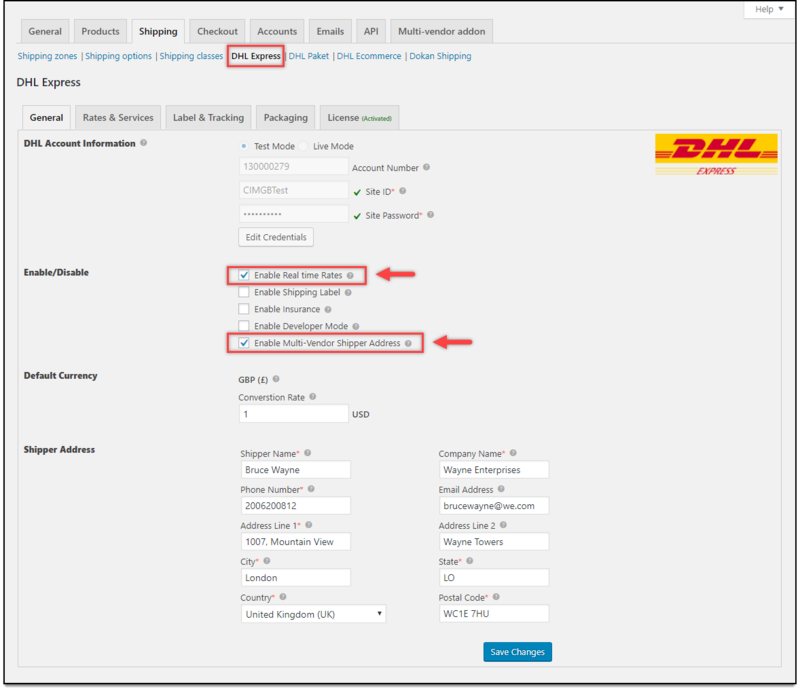 Go to Dashboard > WooCommerce > Settings > Shipping > DHL Express. Remember, the above Multi-Vendor Shipper Address setting in DHL will only be available when Multi-Vendor Add-On is activated. To know more about other features of ELEX WooCommerce DHL Express plugin, refer this article. Consider we have two products from two different vendors in the cart. The Split and sum option from Multi-Vendor Add-On plugin will be applied as shown in the screenshot below. 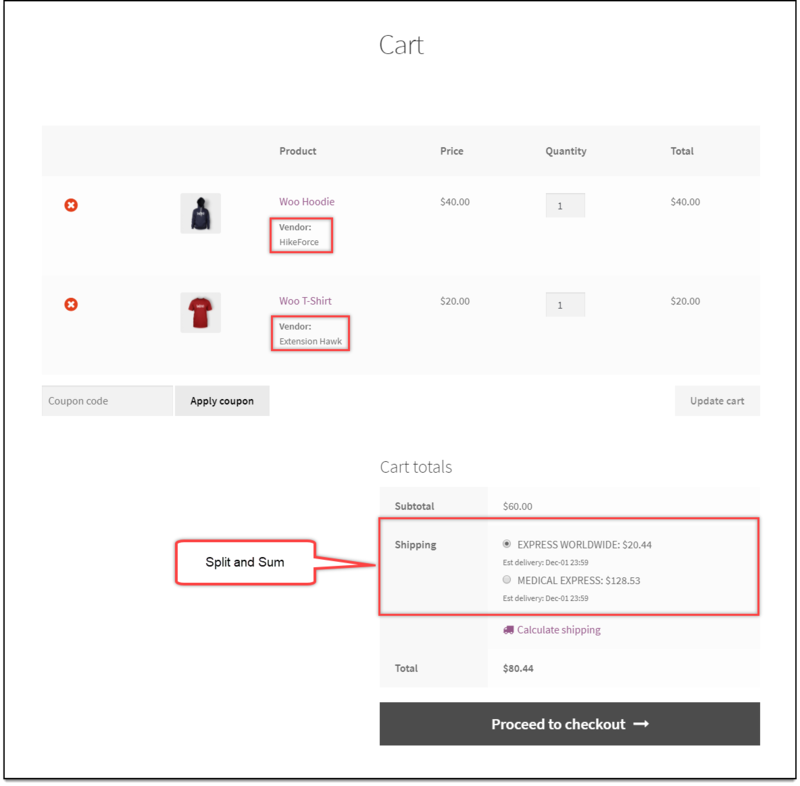 Cart with the Split and separate option will be displayed as shown in the below screenshot. Therefore, in this way, you can boost your multi-vendor marketplace functionality on your WooCommerce store.